Your generous donations have recently enabled progress toward these goals in the US Bureau of Land Management’s Headwaters Forest Reserve. The Reserve includes 7,472 acres just southeast of Eureka, California, covering an area about the same size as Berkeley, California. Named Headwaters because the headwaters of the South Fork Elk River and Salmon Creek are in the area, the Reserve was established after a long and contentious dispute over the logging of its old-growth coast redwood forest. US Senator Dianne Feinstein (D-Calif.) played a central role in negotiating the 1999 agreement that established lasting federal protection for Headwaters. Of the Reserve’s total acreage, 3,088 acres are covered by amazing ancient redwoods. Reserve managers are working to accelerate development of old-growth forest characteristics such as giant redwoods, clear-running streams, and diverse plants and animals on the remaining 4,384 acres, which were extensively logged. The mission is critical for coho salmon and steelhead trout populations, both federally threatened, in the South Fork of the Elk River within the Reserve, because eroding former logging roads bury the spawning beds under blankets of suffocating silt. The 2014 League grant enabled the upgrading and maintenance of 2 miles of roads that are essential for managing and monitoring the Reserve. The League grant came at the right time, when Reserve’s federal funding was cut. “Save the Redwoods League stepped in at a critical point and helped us bridge this funding gap, and we’ve been able to stay on schedule,” said Reserve Manager Ben Blom. Road decommissioning in Headwaters is a demanding task, requiring both heavy equipment and people who know how to employ it with the utmost delicacy. That was evident on a recent day of decommissioning work on a steep mountainside at the top of the Elk River drainage. Ex-logger Gordie Stephens scooped up fill from the roadbed with a gigantic excavator, depositing it into a rugged all-terrain dump truck driven by his friend, Kenny Sauers. After eight scoops, Sauers drove to an old log landing, or large flat area where loggers temporarily stacked logs during previous logging operations. On the landing, he unloaded soil taken from eroding areas for use to restore the mountainsides’ contours. Stephens used the bucket of his excavator to restore the shape of the original slope, the work augmented by a bulldozer where necessary. He placed tree branches and other large woody debris uncovered during the road decommissioning process onto the finished slopes to provide intermediate habitat for wildlife and help stabilize the bare surface. Stephens backed off the road as he worked. In front of him, crewmen spread rice straw on the recontoured ground, protecting the soil from rain splash and providing a thin mulch layer that will promote vegetation growth. An observer could barely tell that a road had been there mere hours before. The mulched soil seemed almost like a meadow blending into the surrounding forest. One year after decommissioning, native plants have grown on a former logging road at Headwaters Forest Reserve. Redwood seedlings were planted as part of the restoration. Your gifts are helping to complete work like this at Headwaters and other forests. Photo by Humboldt State University. The League’s 2014 grant, our first to the Reserve, helped heal the forest also by funding the planting of redwoods and the removal of invasive pampas grass. Headwaters contains several abandoned log landings where, because of soil compaction and the resulting low soil moisture-holding capacity, the forest’s native trees and other plants did not regrow. Instead, non-native pampas grass spread. The California Conservation Corps removed some of that pampas grass. Tree planter Marty Maskill planted redwoods. Eventually those trees will shade out any remaining pampas grass. After the heavy equipment operations and the start of the rainy season, coast redwood seedlings were planted on the newly decommissioned roads once soil moisture conditions were best. As the young redwoods grow, they’ll help mitigate climate-changing greenhouse gases. The historic findings of the League’s Redwoods and Climate Change Initiative show that ancient redwood forests are part of the climate change solution because they store at least three times more carbon above ground than any other type of forest. Maskill said he loves to do his part to restore beautiful forests like Headwaters. Blom surveyed recent restoration work with admiration. Photos by Humboldt State University unless noted otherwise. League members’ gifts support the decommissioning of logging roads like this one in the Headwaters Forest Reserve. Dump trucks like this one help move roadbed soil from eroding areas or buried stream crossings to stable areas to restore the land’s original contours. The excavator scoops soil from a stream crossing filled with dirt during past road construction, and loads it into a dump truck to be hauled off to a disposal site. 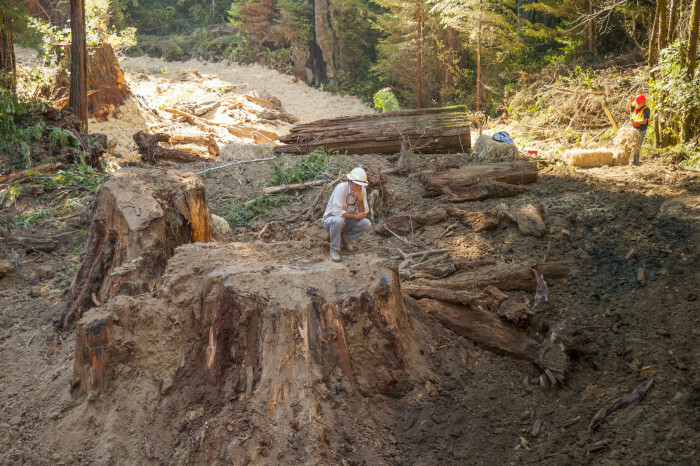 BLM Geologist Sam Flanagan surveys work from the stump of a giant redwood that was logged before Headwaters was protected as a Reserve. The stump had been covered with road fill before road decommissioning. Workers spread rice straw on the recontoured roadbed, stabilizing the soil and providing a mulch layer that will promote vegetation growth. One day, the sites of decommissioned roads and redwood plantings will resemble Headwaters’ redwood groves such as this one. You can visit Headwaters Forest Reserve. From an educational walk along the first mile of trail to an 11-mile hike to an old-growth redwood forest, the Elk River Trail (external link) offers something for everyone. In addition, the Headwaters Education Center (external link), 0.6 miles from the Elk River Trailhead, offers events and educational displays. The Salmon Pass Trail (external link), just outside the City of Fortuna, weaves its way through old-growth and second-growth redwood forests for nearly 3 miles. This trail is only accessible by guided tour. You can help us continue critical recovery work in forests like Headwaters. Your gift today to the Redwood Recovery Fund will be used exclusively to restore redwood forest habitat.